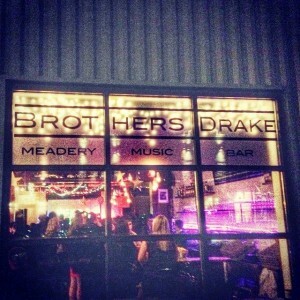 I had two great Jazz Nights Out last week, both at Brothers Drake. On Tuesday, April 1st, I saw Brooklyn’s Rad Trads (as previewed here). Unfortunately, I could only stay for the first set, but what I saw was a swingin’ start to the night. The set was mostly composed of their takes on old standards, with some blues, rock, and a bit of funk starting to show as they progressed. Their amped-up rendition of “St. James Infirmary” was entertaining, with the band providing some rousing backup vocals behind the solemn lead vocals of guitarist Alden Harris-McCoy. The set ended with “Down By The Riverside” as the horn players paraded through the audience comically. It was a great set, and I hear the party cranked up a few notches later on, so if you were there, let us know about it in the Comments section below! The next night, I went back to the meadery to see the one-time reunion of the RFG Quintet. The local soul jazz/hard bop group last played in 2012 or so, as the members (Evan Oberla on trombone, Matteo Amburgy on keys, Nate Smith on bass, Max Button on drums, Kevin O’Neill on woodwinds) moved on to other projects. Though the players continue to make great music today, it was great to hear them revisit this particular soulful catalog. I was not alone in this feeling – the crowd started strong and kept getting bigger, making for a packed second set. The program was a mix of their album May Your Vice Be Nice and a crop of great standards of the soul jazz era. The highlight for me was probably their take on Cannonball Adderley’s “Hummin'” that ended the first set. Amburgy definitely felt the spirit of original Cannonball keyboardist Joe Zawinul – his fiery organ solo was mindblowing, especially as accompanied by Smith’s explosive bass and Button’s lively rhythms. I realized halfway through that they were playing a Cannonball tune without a sax (O’Neill had an earlier obligation and was setting up as the set wrapped up), but it really didn’t matter. Though labeled as “one-time,” I hope RFG reunites again someday. Saturday, April 12th: EOP Digital Release & Birthday Jam at Dicks Den. Evan Oberla stays busy. This show will honor the digital release of his group EOP‘s Here EP in digital format on April 15th. There are also three April birthdays in the band, so come ready to party. This show marks the official debut of a couple new band members and some new originals and covers, so there will be plenty to enjoy. Sunday, April 13th (2pm – 5pm): Dave Greer’s Classic Jazz Stompers at Makoy Center (5462 Center St., Hilliard). The Central Ohio Hot Jazz Society presents its second performance of 2014. This Dayton outfit has been “reintroducing the great jazz of 1920s and 1930s to eager audiences” since the late 1980s and will certainly continue to do so on Sunday. Wednesday, April 16th: FLIPPO at Natalie’s. “One of Columbus, Ohio’s finest Jazz/Rock Fusion ‘super groups,'” this quintet will return to the Natalie’s stage with more quality soulful, funky fusion tunes. According to their Facebook page, expect new renditions of Weather Report and Headhunters classics at this gig. Previous post: New York Comes To The Bungalow!